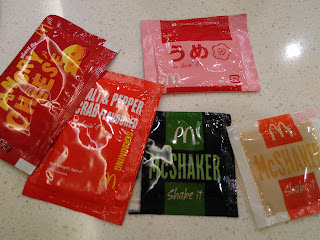 Going to do these one flavour at a time and before anyone asks I know I used to do single reviews for shakers, but I never really liked to try writing an entire full length review for something as simple as a shaker since you can only really identify one or two flavours from each, and the photos of the packaging and a seasoned fry end up looking a bit on the boring side. The other problem is that most of the time when I am trying a new item I don't order fries (unless the wife has a taste for them). 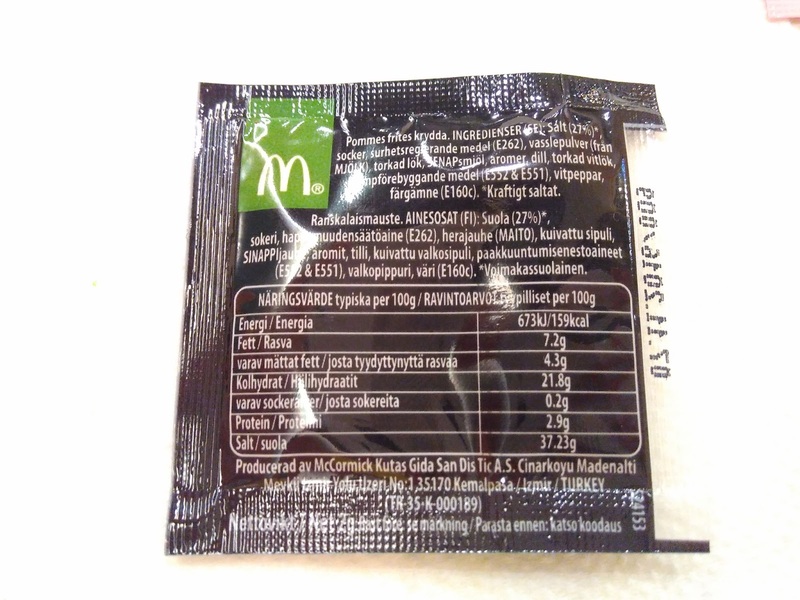 The first shaker I'll talk about were the El Maco seasoning that were actually sent in from McDonald's Sweden themselves. I saw they Tweeted about the new new shakers almost a year ago (yes, that's how long I've been sitting on these...) and I sent them a message seeing if I could give them a try. They very graciously sent me over couple packets to try for the blog. McShakers actually come in a few forms, sometimes they are very fine like a powder, but more often than not they often do have larger pieces of seasoning mixed in. Typically the shakers in western countries are finer than the ones you'll find in Asia, and this was no exception. The consistency was pretty fine, but some did clump together for larger pieces. 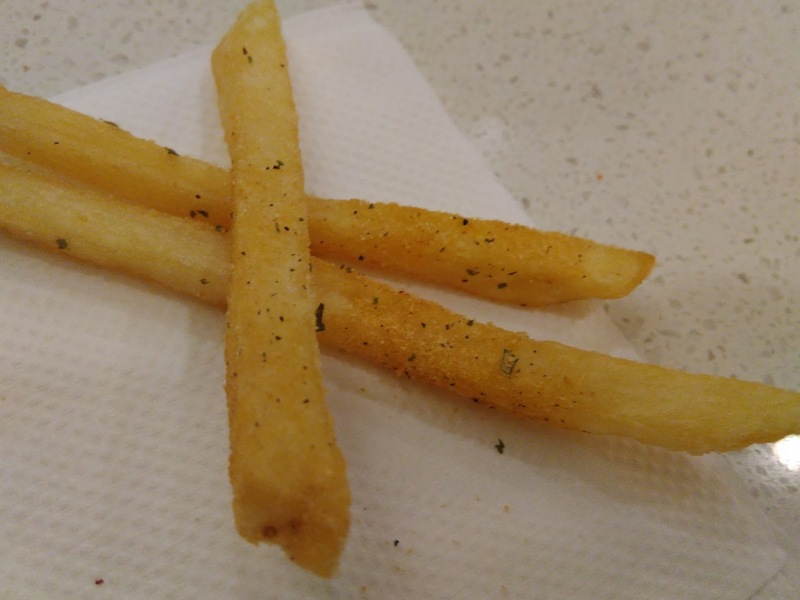 They coated the fries well enough but the larger pieces didn't really stick and just fell off. They ended up tasting exactly like the BBQ McShakers I've tried from Malaysia a few years ago. 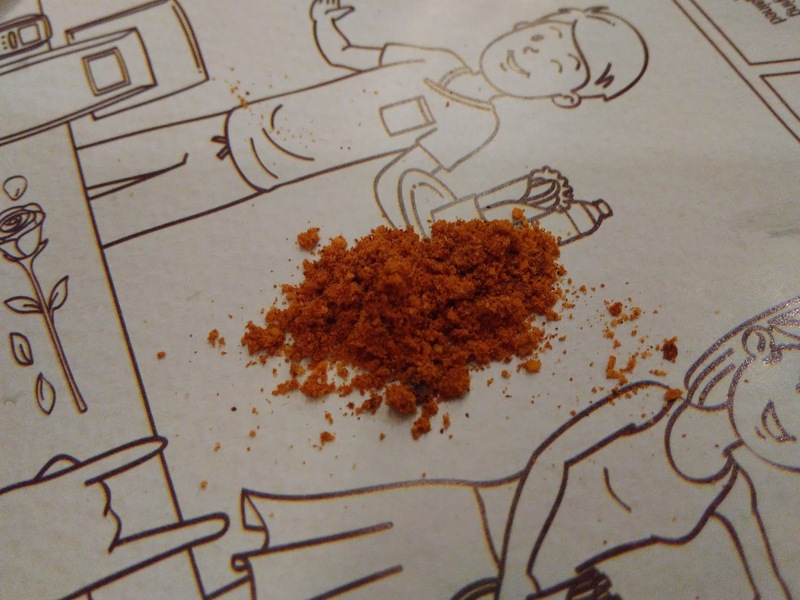 They had a very slight kick to them, but they couldn't be considered spicy, more of a zestiness. 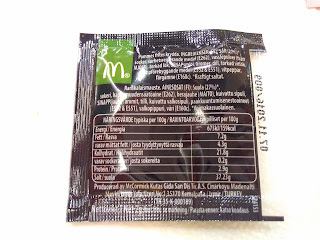 I'm also not totally sure why they were called El Maco, which shares the same name as the salsa topped El Maco Jr burger when these didn't really taste like anything Mexican nor salsa. 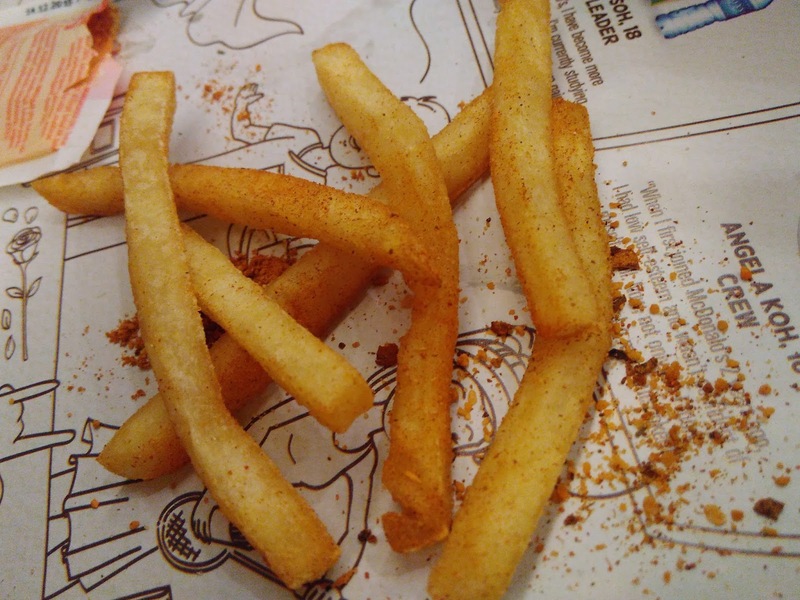 However they were tasty and I finished the entire selection of fries I seasoned with them. Next up were the Dill McShakers, which were also sent in from McDonald's Sweden. I couldn't really give these a proper try since the Thai humidity killed any chance of me being able to shake them on fries as they had turned into an entire chunky mess. 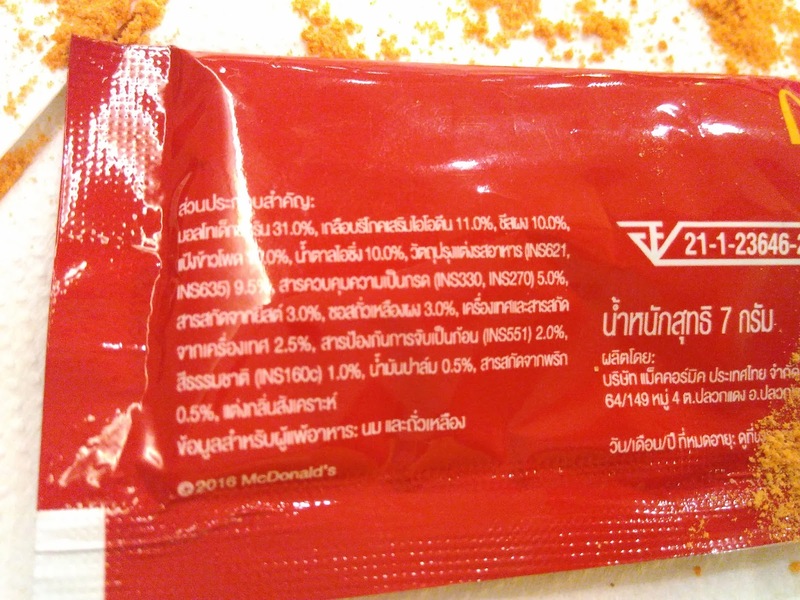 Very strange since the El Maco shakers used pretty much the exact same packaging (and the same Turkish manufacturer according to the back and they never had any problem even when subjected to longer in the Thai heat. 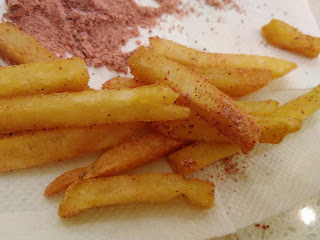 (We keep our spices in the freezer at home so this doesn't happen to everything we buy...) That said I still did break off a few pieces from the chunk and manually stuck it on a couple fries, and WOW were they strong. 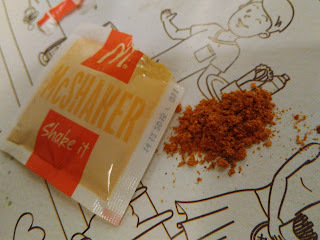 As soon as I cracked open the package I was hit with the strongest scent I've ever had from a McShakers. They were clearly Dill, and I suspect that anyone that likes dill would have probably loved these, but after mushrooms, olive and ketchup, to me dill has to be right near the top of the list that can ruin pretty much anything. These were no exception and I couldn't finish more than a single fry worth. The smell was so strong that I even went to throw away the open package before I could continue reviewing the others. Angry Cheese were picked up by me, right at home in Thailand (well, I say here, but I'm writing this from a plane...) They were sold a couple months back as a part of the Angry Birds move tie in and you would get a package free with any upsized combo. If you asked for one ala carte (which is exactly what I did) they charged you 7THB or about 15 cents. 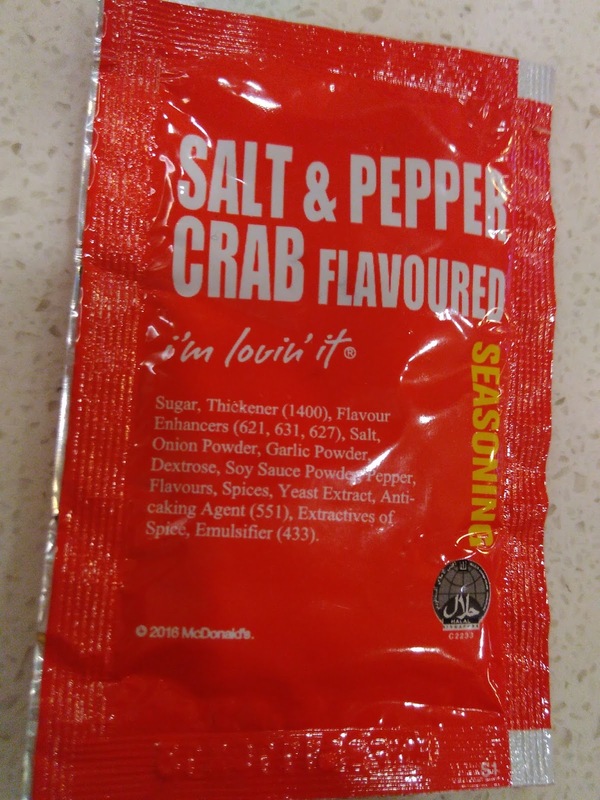 These were the first shakers I've ever had from McDoanld's Thailand and the most noticeable change was simply how large the package was and how much seasoning it held. 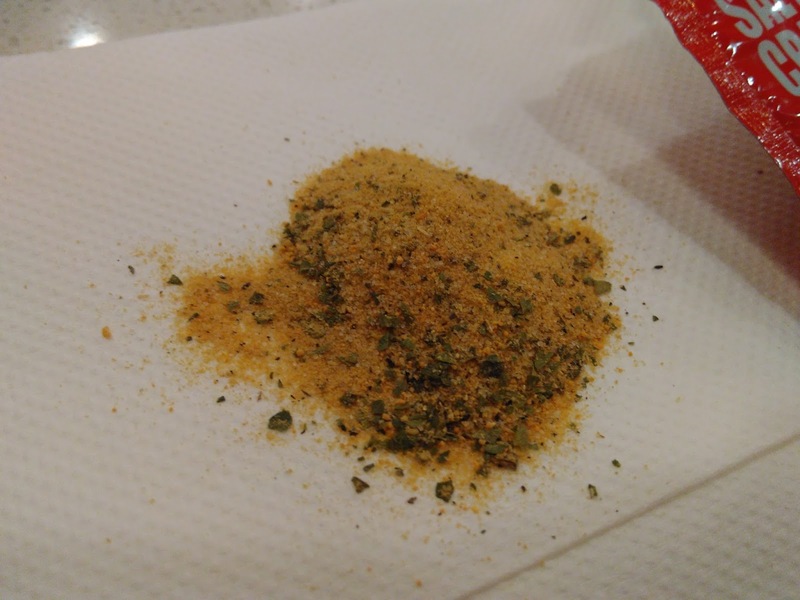 Most shakers very from 2-5g of seasoning but this was a whopping 7g, which doesn't seem like much, but seeing as most people would use an entire packet for a single serving of fries, it really would be overkill. The consistency was just like the other two, being a very find grind which meant the fries picked up a decent coating all around. 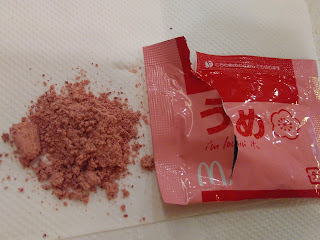 When I tore open the packet, I was hit with a cheese smell which reminded me of parmesan cheese, but the colour was dark like processed cheese slices. I took my first bit of a fry and yes, the first thing I thought of was cheese then maybe 2 seconds later I was hit with a proper dose of spice. 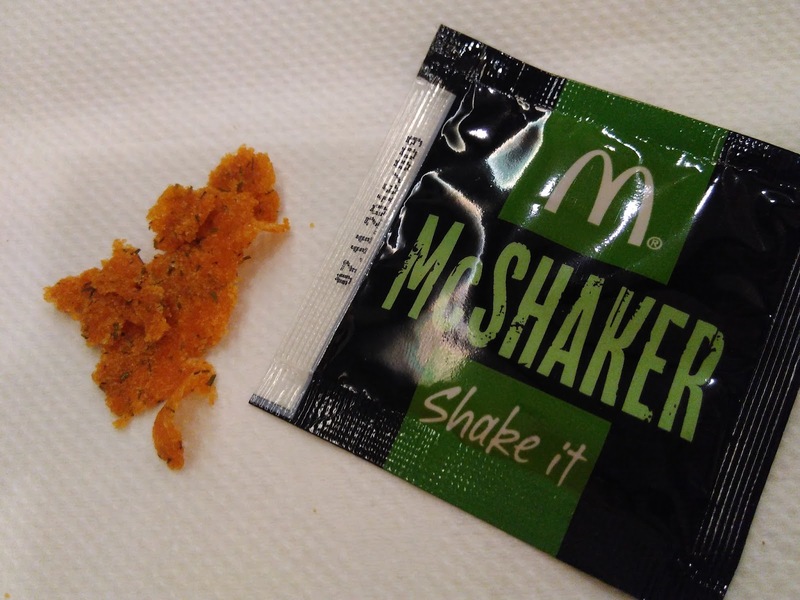 The cheese was certainly "Angry" and it was easily the spiciest McShaker I've ever had. 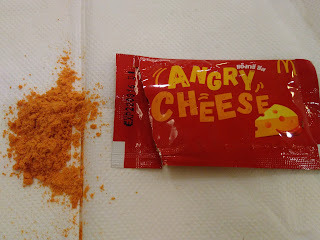 The thing was that I don't think the cheese flavour worked all that well with the spice. I would have liked it on it's own as cheese, and I probably would have liked just a "spicy" McShaker, but this combination wasn't really for me. I did finish the small portion of fries that I seasoned, but I wouldn't have enjoyed a full bag full, nor would I have liked it if I used the entire gigantic package worth. Moving on to Japan. I used to get quite a number of shakers and sauces sent down from Japan because I had a good friend living there. He's since moved away so I don't really have anyone to send me items anymore so I've missed out on a few recent wonderful sounding items like the recent Pumpkin Chocolate sauce or Orange McShakers but a long time Twitter follower helped me out this time on their trip to Japan and was able to get the Ume, or Plum Shakers sent down to Thailand for me. Both the package and the seasoning inside were shockingly pink. I couldn't read the package but I wouldn't be surprised if there was some type of colour in there because I don't see how any seasoning of this kind could be that pink. Also the consistency here was pretty find, but it did have a few non-pink specs of something which were larger than the rest. I'm not totally sure why, but this seasoning was nearly impossible to get stuck on the fry. I shook them around in a bag (like you are supposed to - thus the name "Shakers") but they came out pretty un-seasoned. I rolled them around on a napkin - nothing. I ended up just sprinkling them on top and shovelling it into my mouth in order to get a taste...what I did taste was nothing like I expected at all. Japan Shakers have been pretty hit or miss, and this one was a far, far miss in my books. There was a very repugnant sweet and sour taste which didn't go well with fries at all. You could smell it as soon as you opened the package and eating it was even worse...I actually threw out anything I had left and knocked back nearly an entire bottle of water trying to wash out the taste. 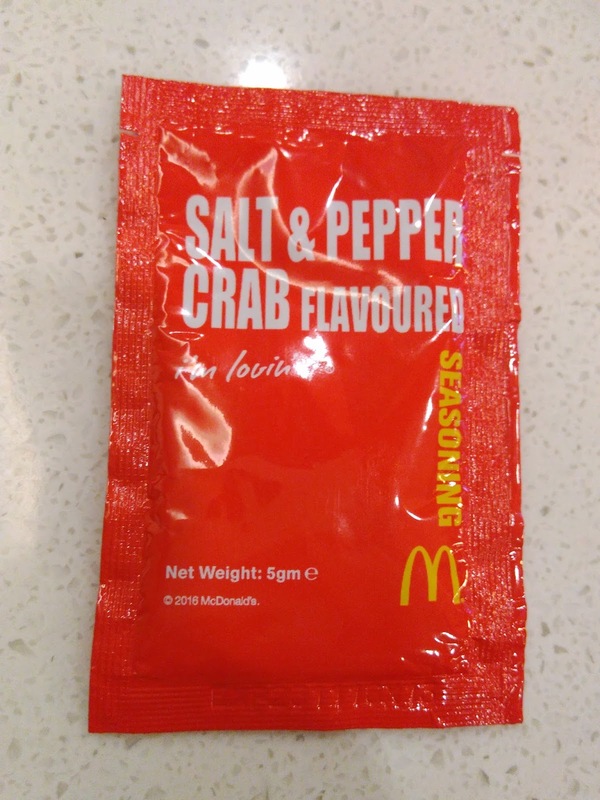 Last one up today will be the Salt and Pepper Crab flavour from McDonald's Singapore. These were actually marketed along with twisty fries which were available a few months back. 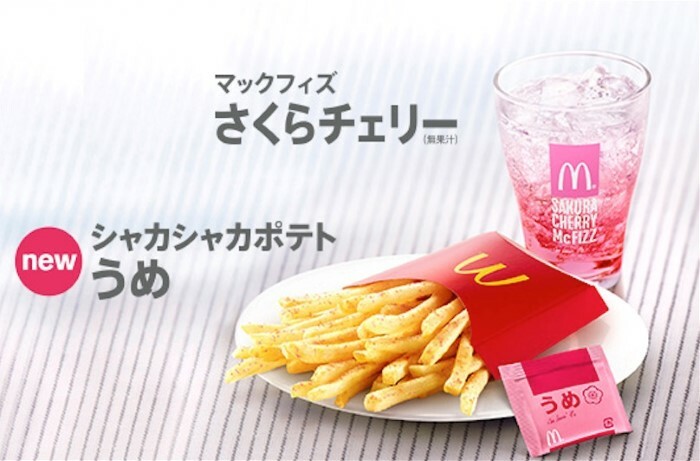 I felt that this was a 100% marketing ploy as they probably just had both items available at the same time and there was absolutely no need to season pre-seasoned twisty fries, so I stuck them in my bag for later sampling. 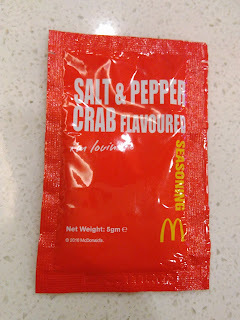 McDonald's Hong Kong had a similar flavour a couple years back, but they have definitely improved on the flavour. Of all the shakers I tried this afternoon, these were using the coarsest grain, and you could viability tell what was salt, what was pepper, and what would have made up the rest of the seasoning, seemingly sugar, onion powder, garlic power and soy sauce powder and filler going by the ingredient list (nice to finally have an English ingredient list). Shakers are usually very salty for my liking and I expected since the first word in the name of these was salt that they would have been too salty for me, but actually the primary flavour that hit me was black pepper. 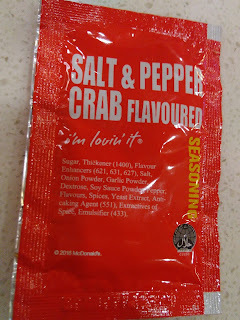 There was a bit of salt, but aside from the pepper you could still taste the seafood taste they were going for together with the onion and garlic. 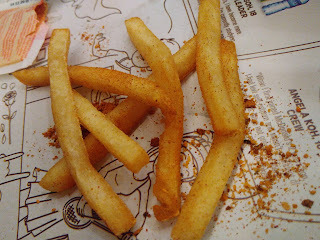 They coated the fries evenly and they were definitely the best of the lot I tried this day. When I visited Vietnam a couple weeks ago I noticed that these exact same shakers, English packaging and all were given out with combo purchases. Also BBQ Shakers from The Philippines were available as well, using their completely different packaging design, so I suspect that any surplus shakers get sent down there. I didn't try any since I've had both before, but I thought it was just something interesting seeing a VN doesn't have that many domestic promo items.